The Property with 450,000% Yield – but There’s a Catch! Between now and the end of November you might need to hope for a few things. We need unseasonal heavy snow across the UK, 5% added to interest rates, stamp duty up another 3%, a stock market crash and ideally, a plague of locusts in the Nottingham area. Oh and on the 24th a broadband failure throughout the land would be nice. To keep the competition away – because on the 24th November you have a chance to buy a flat for just £1 (yes, a pound) in the Nottinghamshire Graham Penny Auction. Everyone else has the chance too! 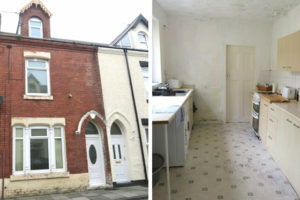 And it needs work too, about £8000 to get it tip top but once done, letting demand will be strong, it’s close to the University and Albert Dock. Beatles fans will be happy there, it’s just a short walk to the iconic Penny Lane and Cavern Club too. Well get it for a quid and it should rent for £375 a month (there’s your nearly half million percent return every year) – that’s the cost of it’s cheapest comparable on Rightmove. A one bed house share just around the corner is £350 a month. So what will it sell for? Well, nobody knows until the day itself. The housing market is still jittery and even at auction many properties have failed to sell but we think it’s unlikely to go quite that low. But even if it goes for a massive 10,000 times the reserve price, the return is still a bank busting, wallet filling cash generator at 45% per year! Even more information can be found on the Rightmove property page.